The evening Mass on Saturday, 4 February 2012, in St Peter’s Church, Drogheda, was the occasion for the official farewell by the parishioners to a much-loved priest, Fr Sean Ryan SMA, who after 54 years of priestly ministry was taking a well-deserved rest. Fr Sean was the Principal celebrant, assisted by Rt Rev Monsignor James Carroll (Parish Priest) and Fr John Denvir SMA, representing the Society of African Missions and Co-Leader of the SMA community in Dromantine, Newry where Fr Ryan will now live. In a sense, Fr Sean is going back to his roots for it was in Dromantine that he studied for the priesthood all those years ago. Monsignor Carroll preached at the Mass and expressed gratitude to Fr Sean for his years of service in Drogheda, and indeed all his years of service in the Archdiocese of Armagh, following his return from Nigeria. 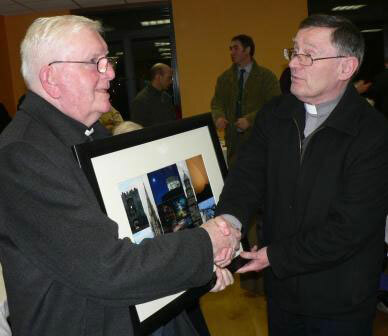 Our picture shows the Monsignor presenting Sean with a picture of several Drogheda landmarks. Prior to coming to Drogheda, Fr Sean had ministered in Dunleer and Tallanstown. Fr Sean was born in Louth village and, after the normal schooling and seminary training, was ordained a priest for the Society of African Missions on 18 June 1958. 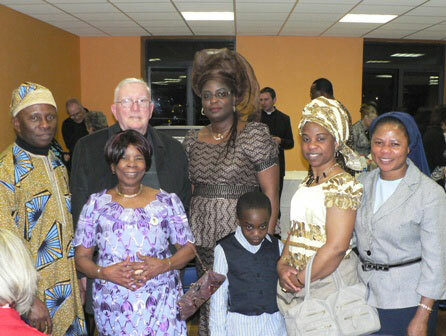 He was appointed to Midwest Nigeria along with two classmates, Fr John Casey and Fr John Flynn. After some months in the Tyrocinium studying the local languages and culture, Fr Ryan was appointed to Ughelli. He was to serve a total of 42 years in Nigeria. Fr Sean is pictured with some members of the International choir at St Peter’s. Sean was always thorough and regular in the pastoral ministry. The vast number of outstations in the Riverine area were visited frequently by a canoe with outboard engine. It was a difficult mission by any standards. … When Sean returned to Bomadi in 1984 for another long spell he was greeted with great enthusiasm and they acknowledged that he was the only ‘Fada‘, and for that matter the only white man, ever to come back. The diet was simple; yams, gari and fish, meat being a rare luxury… Sean will be remembered for doing many wonderful things during his 42 years of service … but most of all for his dedicated service to his beloved Ijaw people… I think mission history may well refer to Sean Ryan as the Apostle of the western Ijaws” (pages 95-97). During his years in Nigeria, Fr Sean worked mainly in the riverine area of the midwest. When he went there in 1958, the area was one diocese, under the leadership of Bishop Patrick J Kelly SMA. Fr Sean was to witness the birth of 4 other diocese from Benin City: Warri, Issele-Uku, Uromi and Auchi as well as the Vicariate Apostolic of Bomadi where he was once Parish Priest. On Pentecost Sunday 1994, Fr Sean took charge of a new SMA parish – St Patrick’s SMA Parish, Cable Point, Asaba. It was exactly 106 years previous that the first SMA, Fr Carlo Zappa from Italy, had set foot in Asaba. Fr Sean’s first challenge was to complete the Church building and, when he left finally for Ireland, St Patrick’s was the best attended church in Issele-Uku diocese. In Asaba, he worked alongside Fr Fabian Hevi SMA (from Ghana) and Fr Donatien Djohossou SMA (from Bénin Republic). In 2000, he handed over to Fr Mattie O’Connell and returned finally to Ireland to continue in active ministry until his recent retirement. 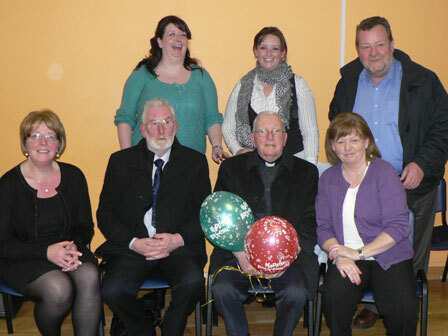 Fr Sean is pictured with some family members who came to wish him well too. At the end of the Mass, Fr Sean thanked the clergy and parishioners for their help to him during his time in St Peter’s and prayed God’s blessing on them all as he parted. A large congregation participated in the Mass, as well as several priests from neighbouring parishes. St Peter’s Parish Hall was the venue for a Reception after the Mass and the large turnout was a mark of appreciation for his dedication to the parish during his years there. Presentations were made on behalf of a number of organisations and a number of speakers paid tribute to Fr Sean.